Bebop and Rocksteady have taken to the streets and rob a pet store of its supply of food. The deadly duo then make their way to the zoo, where they apparently begin to fire their weapons upon caged animals. Meanwhile, the TMNT are facing their worst (and weirdest) foe yet – the head of Krang on the body of Shredder! With little time to spend gawking at this oddity, the TMNT brace themselves for another attack by Slash, Bellybomb and the Krang-Shredder monstrocity. Early on, Raph entices Slash to run off in search of his palm tree, making the odds better for our heroes. Shortly, Slash finds a pet store and breaks the window to gleefully steal a small plastic palm tree. Eventually the Turtles’ teamwork enables them to get the upper hand in the fight. Raph rips Krang off of Shredder’s body, while Mikey twirls his nunchukus and forces Bellybomb to get a giant whiff of his own toxic breath, thus disabling their remaining adversaries. Just as the Green Team is ready to celebrate, Bebop and Rocksteady arrive with a huge array of animals that they’ve freed from the zoo and level their guns at the Turtles. The TMNT drop their weapons as Shredder awakes. Saki relunctantly states that the Turtles saved his life and dejectedly walks off, but before he gets too far, Leonardo reminds his old foe that he owes the Turtles now. With is head bowed, Saki replies, “I know… I know.” and disappears into the night. Bebop and Rocksteady load the spaceship with their animal companions from the zoo, as well as Krang and Bellybomb, and head for outer space. 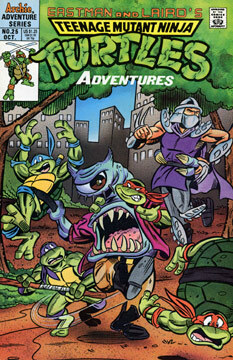 The Turtles worry that both Shredder and Slash are on the loose again, and make their way back to the sewer. Bebop and his partner drop Krang and Bellybomb back on the toxic waste planet before returning to the jungle world – which they’ve decided is home. Features an additional 8 page story starring April O’Neil and the Warrior Dragon entitled “Dragon Rage” by Dean Clarrain and Chris Allan.